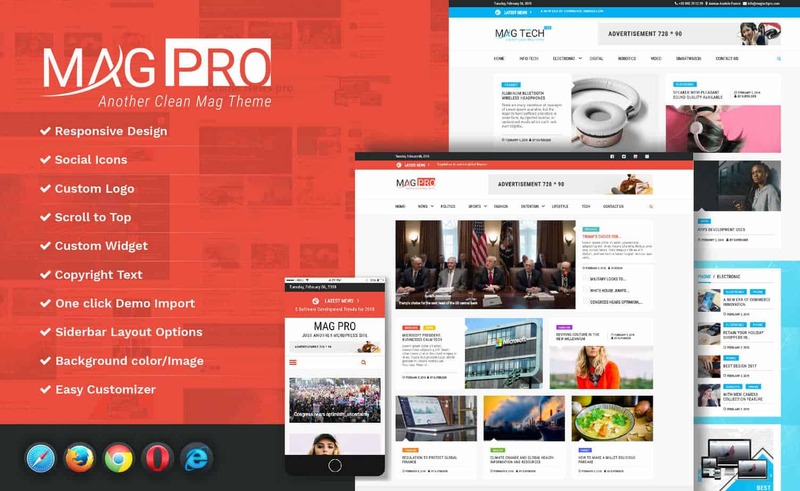 Introducing Mag Pro- A feature-rich, advanced and visually appealing WordPress theme! Working endlessly to meet our client’s and user’s need for more advanced and flexibility with our WordPress products, we are proud to present our latest addition Mag Pro. A feature-rich WordPress online Magazine theme perfect for any news, editorial and online magazine websites. Yes, it is finally time that we bring to you one of our best work! Flexible, clean and well structured, Mag Pro is built with dedication and great attention to details. Tired of looking for a theme to compliment your site and make it capable of competing in the tech-savvy environment? Well, your search ends here! Featuring the professional outlook with an equally appealing sleek and clean design, we have finally come up with the Best WordPress online magazine theme that is perfectly suited for the online publishing industry! Giving you the competitive advantage, Mag Pro features all the latest designs trends and highly adjustable theme customizer. Perfect for any editorial, magazine or news websites, this theme is efficient and feature packed with custom widgets that will make your job easier. Fully responsive and widget based theme, Mag Pro offers plenty of features to make sure our users get nothing but the best WordPress experience. So what exactly makes this theme one of our best WordPress online magazine themes and why do we think it is the answer to all of your theme queries? Let’s talk about it in detail. The first impression of any website is basically the outlook of how appealing the site is to the users. So, let’s start off by talking about Mag pro’s fully responsive and attractive interface. Modern, clean and sophisticated feel to the design is not only appealing but it keeps your users hooked on to the site for a more professional and informative environment. Perfect to share all the updates, news, articles, storylines and any type of online publishing, the responsive design will make sure your site detects the visitor’s screen size and orientation to change and display the layout accordingly. Mag Pro is also fully widget based theme, which means that if you need to get anything done, a simple widget will help you out in a matter of minutes. Extremely efficient way to function your site, it is simply a well-structured theme that takes your website to a whole new level. Easy Customization Options with Live Preview! With powerful and advanced customization option, Mag Pro allows you to craft the perfect site exactly the way you want. You can easily edit the elements of the theme including the custom logo, background color and image. Moreover, you get unlimited color options whether it’s the primary color choice or for the category colors! Add a hint of style with elegant, stylish, bold and professional looking typography. What’s more you say? Well, you can also add custom logo along with SVG logo image and site title as well as tagline! And that is only the start. Because you also get to choose from the different Sidebar Layout options to make your site look more appealing. Furthermore, get an inbuilt contact page template to start connecting right away! And you can preview it LIVE on the Live customizer! Which means that only YOU have the control over how your site looks and you can publish the changes after you are fully satisfied. No need to save the changes and go through the hassle of changing it again and again until you end up with the one that you like. What is the best part about installing this theme? You can start right away with the one-click demo importer that gives you the access to build your site on the format of pre-made demo pages. Yup, that’s right. No need to start from scratch! Simply install and import the demo pages, choose the one you like and start building! Add more widgets along the way and remove any elements you find useless. Easy, efficient and real time-saving method to create the perfect WordPress online magazine themed website! While images and video are one of the major elements to keep your site engaging, the typography of any site is equally important. And Mag Pro being the perfect WordPress online magazine theme for any online editorial and publishing website makes sure that no stone is left unturned. The theme comes fully equipped with awesome fonts option from Google Fonts! Yes, that’s right! Our sophistically beautiful and professional theme has utilized the awesome source for designers-Google Fonts! Thus, we bring you a collection of stunning typography that can be used with the theme! Add the extra touch of elegance, boldness, and edginess whichever you prefer with the Integration of Google Fonts in a matter of seconds! With more creativity comes innovation, and with more innovative ideas come our latest WordPress online magazine theme Mag Pro. With powerful customizable options, the theme also allows the users the choice of unlimited colors. Want your website to match the color combinations of your company’s logo? Whether you wish to stylize your site in a minimal aspect or go bold with strong colors! It is entirely up to you! Most WordPress themes come with a limitation when it comes to color choices. But this theme is not one of them. Yup, that’s right, you get not 5, not 10 but UNLIMITED color combinations. So, the choice is entirely up to you! Simply visit the color customizing option and choose from the range of color palette you wish to use. The color palette available makes sure that any color of your preference is available! And by any colors, we mean any shade and any variety! With Mag Pro, anything is possible! 12 Awesome Custom Widget Options! When we say that the theme is entirely widget-based, we mean exactly that. 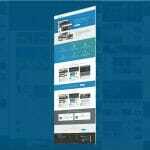 Because this amazing WordPress news theme comes fully equipped 12 awesome custom widgets! You can use it to perform various functionalities on the site. Here is a brief introduction to each one and how it helps our users! Easily add promotional advertisements of your brand or sponsored products with a touch of a button. Simply drag and drop the widget and adjust as necessary! Want to integrate your audience to a larger scaled social media? No need to go through hassles with easy Facebook and Twitter integration! This option enables the users to showcase all of the contents of your site that are latest or popular according to your preference. The users will have the full control over how many posts and the number of tabs the widget displays. Looking to hook you users onto other useful contents on your site? The Home Promo option allows the users to do exactly that. You can display any content of your site by simply choosing the category and the number of posts to display. Then choose the widget friendly area and you are done! Mag Pro also gives you the option to display a specific category in an interesting and appealing way as a slider on any widget friendly area of the theme. For easier access, the theme allows your users to add a specific Home Tab collection or the menu on your header to link it back to the pages as the name suggests. Display the hot news and latest updates with a catchy headline displayed through a scrolling electronic display! Choose the number of titles and the category to display and that is it! Simple and perfect for any news and magazine sites News Ticker Slider is the best way to get results fast! Showing Promo or simply a hint of what the content dwells in is the best way to attract viewers to your site. Add commercial contents on headers, sidebars or footers to attract more viewers to the post that you target! If any viewers are new to the site, giving out links to other recent posts might get them intrigued! Another major way you can increase the click-rates is by adding links to your recent contents on any widget friendly area! Videos being more and more popular and effective ways to keep your user’s engagement on your site, the theme allows the users to easily embed videos as a widget! Attract more viewers and promote your site creatively! Integrate the latest posts or the popular posts from your website for easier access to the sidebars of the theme. The best part about any of our WordPress products is that we are always there to help our valued customers! Whether you have a query about our plugins or themes, you will get our undivided dedication and support to help you solve it! Whether through forums, FAQ’s, theme or plugin instructions, we are always eager to advice and aid our customers in need. And that too with no additional cost and absolutely FREE! When it comes to our service, by now you might have already understood that we serve nothing but the best! And with Mag Pro, our team of dedicated developers is always working to make sure all the elements of the theme are regularly updated. And thus, we make sure that our users never come across unnecessary lags or issues. Adding the latest and advanced components, every now and then our users will never stay outdated! If you think that Mag Pro limits to only the above-mentioned features, then you are absolutely wrong. One of the most feature-rich themes for your site that you can find out there, here is a sneak peak into what more it offers! Background Color/ Image customizing option. Archive and Contact Page Template. And that’s not all, if you want to check out all of their features, view it all right here! Simply stunning and worthy of all the appreciation, Mag Pro certainly makes sure your site stand out from the rest. Amazing features, advanced widgets, stunning design, SEO optimized, what else can you need? Truly mind-blowing is the only word that describes the overall outlook it features. Win over the competitive tech-savvy environment and rule the web publishing industry! Not only visually appealing but we have put in an equal effort with the effectiveness and usefulness as well! Experience the best pleasure of working online with the Best WordPress Online magazine theme out there- Mag Pro! Hesitant to invest at first? Try out the free version- Mag-Lite and we are definitely sure that you will be back wanting more! Got questions? Having an issue with something on the site? No worries, our friendly support staff is waiting to help you. All you need to do is, simply send us an email with a complete description of the problem, question or issue you’re having with the site. Mag Lite: Best Free WordPress Online Magazine Theme! Get An Amazing Business Portfolio With The New WordPress Theme Portfolio Pro! Start A Stunning Business Portfolio To Impress Only With RT Portfolio! 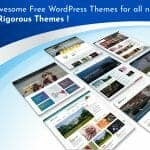 7 Awesome Free WordPress Themes for all niche by Rigorous Themes!